I'm trying to think up some ideas for Christmas presents that I can get started on and I came across lots of cute heat packs on Pinterest. I was torn between making one of those and making a hot water bottle cover when I realised I could just combine the two! :) Just fill the little hot water bottle with rice and a few drops of lavender oil and you have a microwavable hot water bottle! 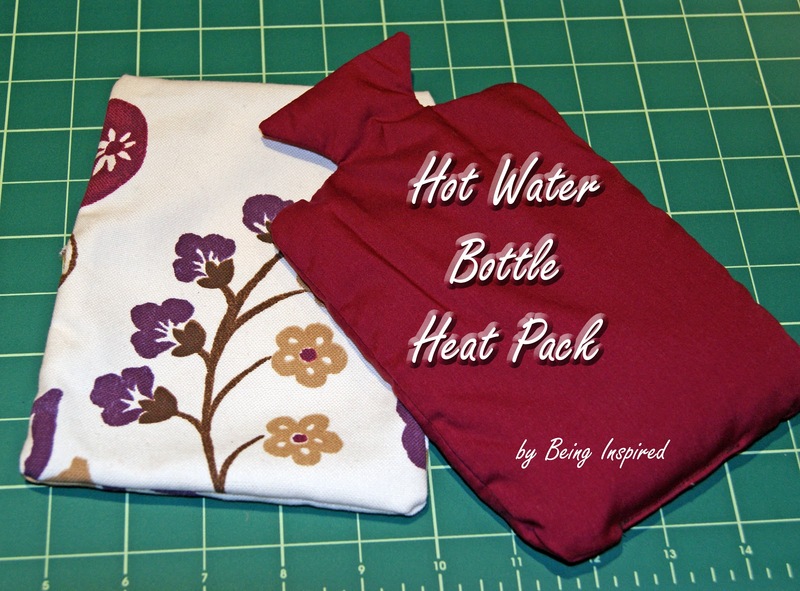 First download my hot water bottle template here. This make quite a small hot water bottle but you could easily enlarge it. Print and cut two copies of the template in a cotton fabric. Mix some rice with a few drops of lavender oil and leave to dry. Then fill your hot water bottle with rice. Sew across the bottom to close it up. Next I sewed a little cover for it. I kinda just figured this out as I went, using the original template as a rough guide. As you can see from the picture, just leave a few inches of extra fabric at the top. I cut along the fold. Then sew it up in a similar manner to the soap pouch I made. This is what the other side looks like, with the hot water bottle tucked safely inside. - I filled mine with rice as that's what I had in the cupboard but after trying it out a few times it doesn't really hold the heat that well. It's lovely and hot for about 10 minutes but it'd be nice if it lasted just a bit longer! I know you can use buckwheat and flax seed too so maybe they'd be better! - This little guy is quite small so I might have to make a bigger one next time. You could easily enlarge the template though. - Be careful when heating these in the microwave, nothing worse than smelling burnt rice instead of lavender! They're pretty small so 1 minute to 1 and a half minutes max! It's a good idea to watch it and turn and shake it half way through. *Thanks to Melanie @ My Mulberry Junction for her comment - dent corn might be a better option than rice to keep the heat a bit longer! :) And to Jessi @ Practically Functional who suggested using lentils instead! I think I'll just have to make another one to test it out! Oh and thanks Fran for her tip about putting a cup of water in the microwave with the heat pack to keep the rice from drying out/burning! This is one of my favourite activities for teaching the letters of the alphabet. Its basically a whole bunch of shapes that can be used to make the letters of the alphabet. The letters are each a different colour so it's easier for kids to find the right pieces. Then they have to figure out how to put them together to form the letter. I give them a little checklist so they can keep track of what they've found. Ticking off the list is often their favourite part! It also provides a little help if they're struggling to remember what some of the letters look like. It's laminated so once they've found them all I can wipe it clean for the next kids! So where can you get your own set? You can download the alphabet puzzles for free at kizclub.com. And you can download my checklist for free here. Then just print, laminate and cut! - Make sure to laminate these! They hold up pretty well if you do, and after all that cutting you'll want them to! I laminated them before I cut them out. This saves cutting twice and means the pieces line up properly. But they're not quite as durable as if you laminate them after cutting. - I keep them all in a little plastic folder with the checklist and a pen. It's perfect for centre work or early finishers. - These would be great to use at home if you printed them on magnetic paper and let your kids use them on the fridge. - The shapes can also be used to make all kinds of fun pictures and creations too! - Kizclub.com is amazing! 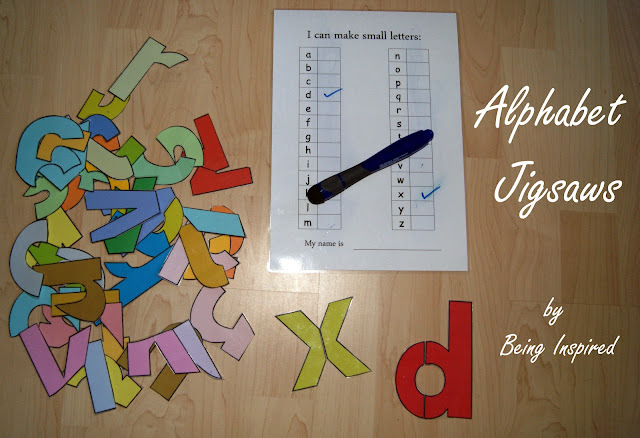 There's loads of free resources for picture books and alphabet and phonics activities. They also have this puzzle in capital letters. Well I finally made it! A cute little mini oven mitt! Cute huh? It's much less bulky than a big oven glove, easier to get a grip on small things and it doesn't take up so much room in an over packed kitchen! I got the inspiration over at The Idea Room and there's an awesome tutorial and pattern there too. I changed mine a tiny bit and used a plain fabric for the inside part instead of two contrasting fabrics for the back and hand parts. These are the front parts, where your fingers will go! The underside is a plain white fabric and there's some batting in between. The back of my little soon to be oven mitt. I had serious issues with the bias tape. One of many attempts here! It's the perfect size for gripping hot muffin trays as you take them out of the oven. Here's the other side. And the not so perfectly sewn bias tape. But I still think it's kinda perfectly cute! - I used bias tape for the edge of the hand parts too instead of coordinating ribbon (as per the tutorial). It was easier and I kinda like the look more. So I've been busy thinking up ideas for my Halloween costume this year. I'm leaning towards a Mrs. Potato Head costume inspired by this one over at Seven Thirty Three. But I'm not sure what my plans for Halloween even are yet so we'll see! But all this thinking has led me to reminisce about costumes from my pre-blogging life. There were some good witches and cats and other incredibly uninspired creations... But there is one that I'm kinda proud of. 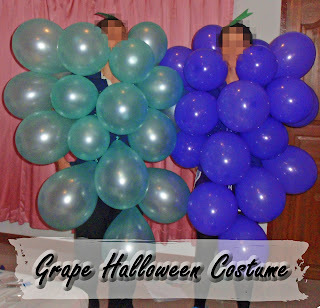 And it's really quick and easy to put together - a bunch of grapes! 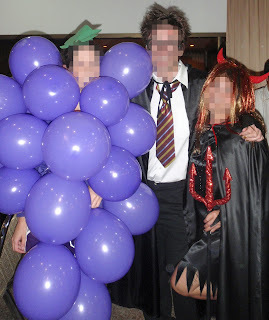 It was for a costume party at the end of a professional development course when I was living in Thailand. We went away for a week of lectures, team building activities and a bit of bonding over multiple drinks. :) So it had to be something that would fit in my bag to bring with me! 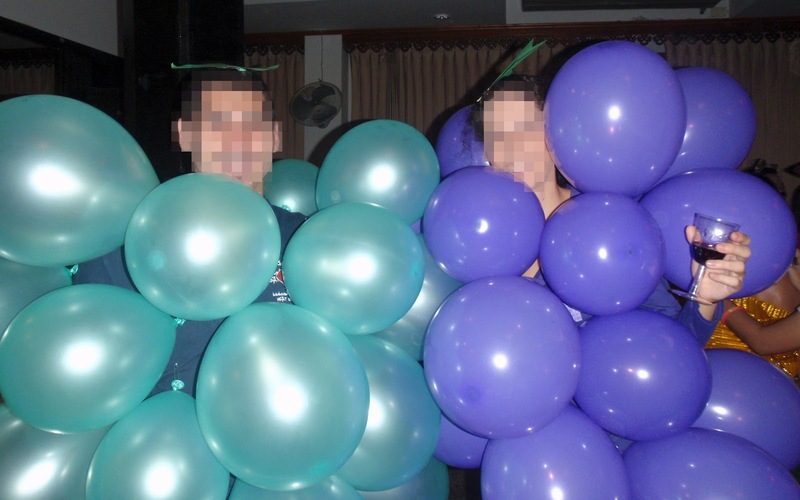 I really wanted to go as the teenage mutant ninja turtles but I couldn't convince 3 others to join me so I settled on grapes. Wear some purple shorts, tights and a top and then attach the balloons using safety pins. Then make some leaves out of green paper or felt and attach to a hair clip! Easy! 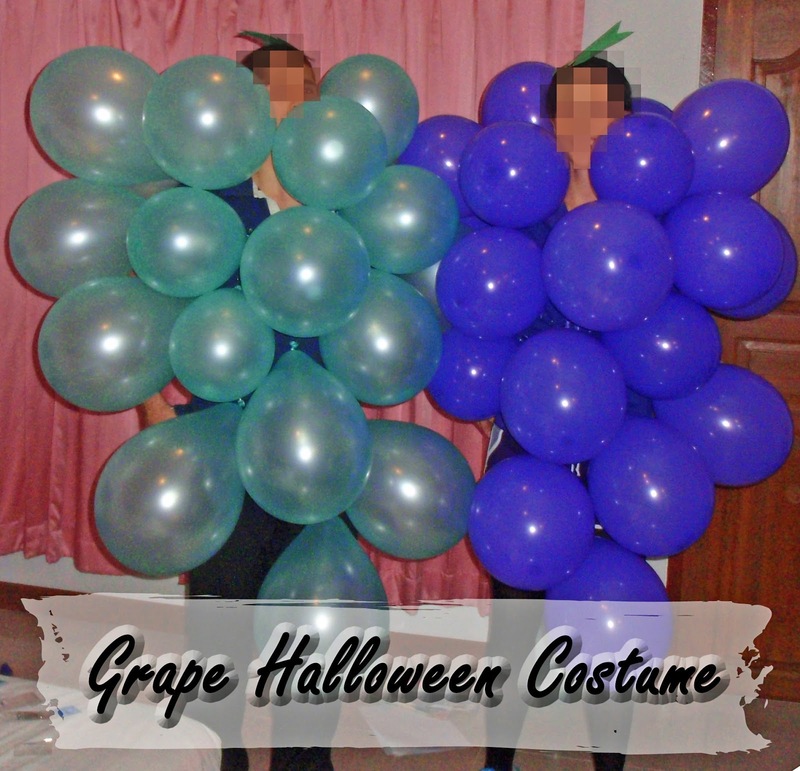 :) And if you can rope someone in to be the green grapes even better! Word of warning - people will want to burst the balloons so buy good quality ones and try to hold them off til the end of the night! :) People also had lots of fun writing on the balloons too. - It's pretty tricky to sit in this costume so maybe it's not the best for any parties that involve sitting down to eat! - And it's pretty tricky to eat and drink too! I could pour the wine but I could bring the glass close enough to my mouth! Thankfully balloons burst easily so I just got rid of one. Crisis averted! 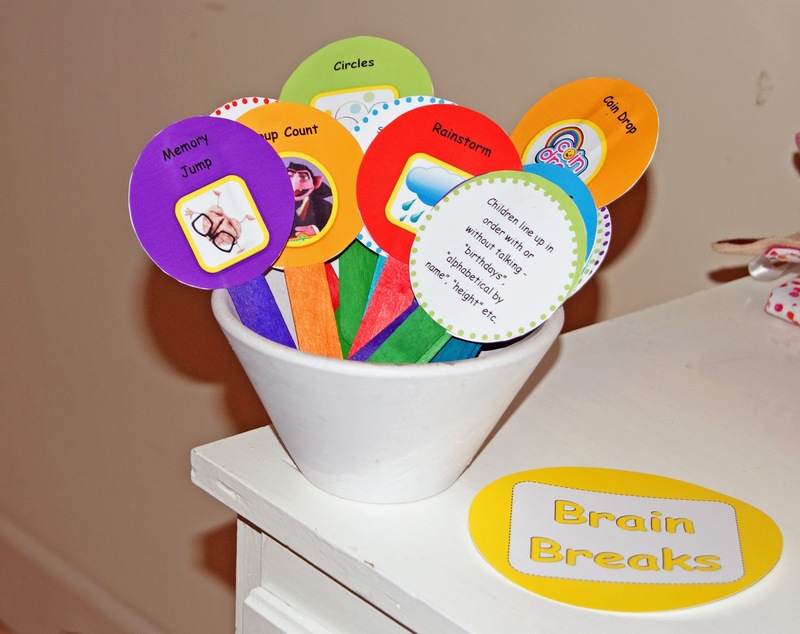 I'm sure all you teachers have seen "Brain Breaks" cards and lollipop sticks all over blog-land and Pinterest. Just in case you haven't (and for the non teachers!) the idea behind them is that you have a stack of ideas for activities and games for when your class need to give their brains a little break. They'll still be using their brains of course but in a more fun way! Some of the best ones are very active and give a noisy class a chance to burn off some energy before settling back down to work. Of course there's no reason why you couldn't adapt these for use at home too! I'll include the word doc at the end so you can edit them so they are most useful for you and your kids! You can absolutely make these just by writing the names of the activities on lollipop sticks. It'll be much quicker for sure. But I'm not sure they'll look quite as cute. And I have done most of the hard work for you! Plus the problem with just writing them on sticks is that you have to learn off the rules for each game. This way you'll have a cute picture on one side and a brief explanation on the back. Easy! I've divided the activities into categories and colour coded them because I'm like that. :) And it will make life much easier! Sometimes you might want to focus on maths skills so you can purposefully choose a maths activity. There's also a few that involve the kids getting out of their seats, something you might not always have time and space for so you might want to avoid them! All you have to do is print, cut and stick! I printed mine on photo paper as my laminator is broken and I wanted them to look glossy, but paper or card would work fine either. There are of course hundreds of other activities that you could add. So do send me a link if you make some new ones of your own! :) Or leave me a comment with some ideas and I'll try add them in. And if any of the descriptions don't make sense let me know! Click here to download your own Brain Breaks! *If you'd like some more freebies be sure to follow blog and TPT store and check back in every Friday for a new freebie! Here's what you've missed so far - Friday Freebie #1, Friday Freebie #2, Friday Freebie #3, Friday Freebie #4. - Always proof read before printing on expensive photo paper! I forgot to change the colours so my maths and literacy ones as mixed up. :( Don't worry I've changed it now though so yours will be fine! - These can be used when the class is losing focus on the task at hand, as a classroom management technique. - They're also great as a reward when the class have been very well behaved. 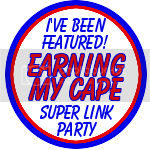 Or an individual reward for one child who gets to select the "brain break". - Try using them as early finisher activities for small groups too. - There's lots of commercial games that you could use in a similar way if you don't have the time to make these. 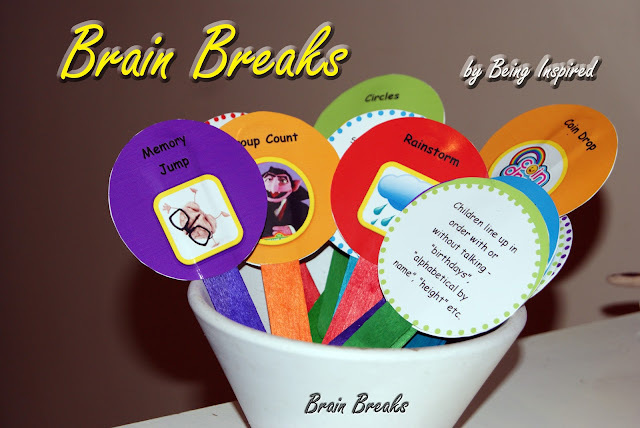 I love the look of Cranium Brain Breaks for example. So you know that iPad I won? Well for the competition you had to create a fun lunch box. 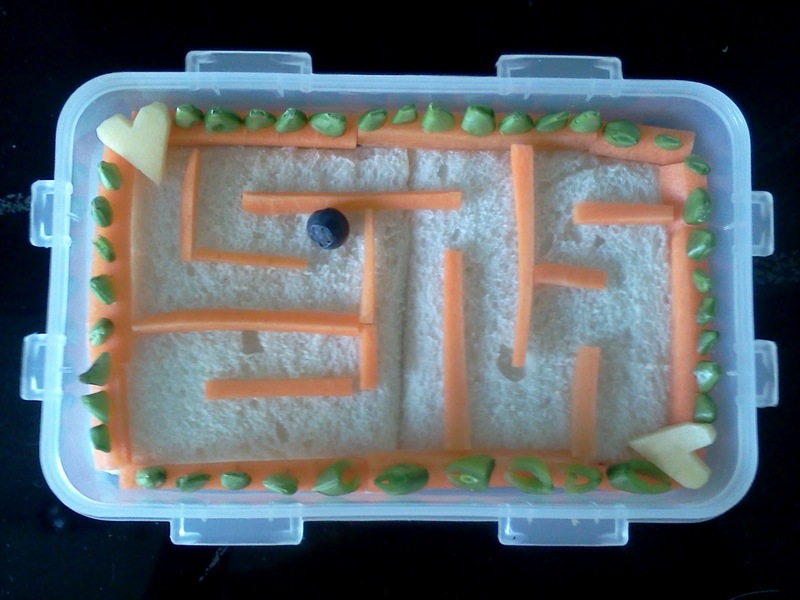 I won with my Sesame Street fruit snacks but was originally going to enter this a-mazing lunch box instead. 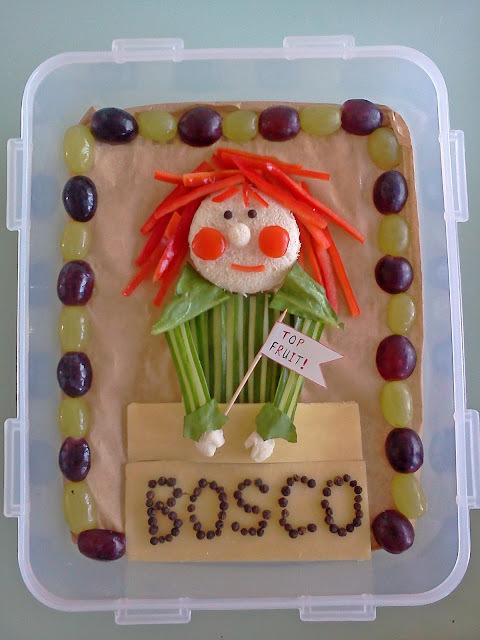 I realise Bosco probably means nothing to most of you. If you were a kid in Ireland in the 80s then you'd understand! :) But thanks to the magic of youtube now you too can join in on the fun! Come with me through the magic door! - You have to be really careful with the scissors! So if you're not a fan already I urge you to give it a try. Best part is its so easy to make. The only tricky part is choosing ripe avocados! So many times I've bought them with the intention of making some guacamole that evening only to cut them open and find out they're hard as a rock. So err on the side of over ripe here! You really can't mess this one up other than that though as it's really up to you how much of each ingredient you add or which ones you omit. So long as you've got mushed up avocado it's guacamole! I love garlic so I put in two cloves but that might be a bit much for some! Same with the lime, I used the juice of about half a lime but you might like less. I use bird's eye chilies as I used to live in Thailand so they're my go to chili. But use whichever ones you like. Just be careful when you're handling it. Keep your hands away from your eyes and wash them well afterwards. Add as little or as much chili as you can handle! First cut your avocados in half and remove the stone. Scoop out the flesh and place in a bowl. Mince the garlic clove and add to the bowl. Squeeze in a tbsp of lime juice. Mash with a fork or blend for a few seconds (depending on whether you like your guacamole chunky or smooth). Dice the red onion, tomato and chili into small pieces. Roughly chop the coriander leaves and stems. Add to the bowl and mix well. 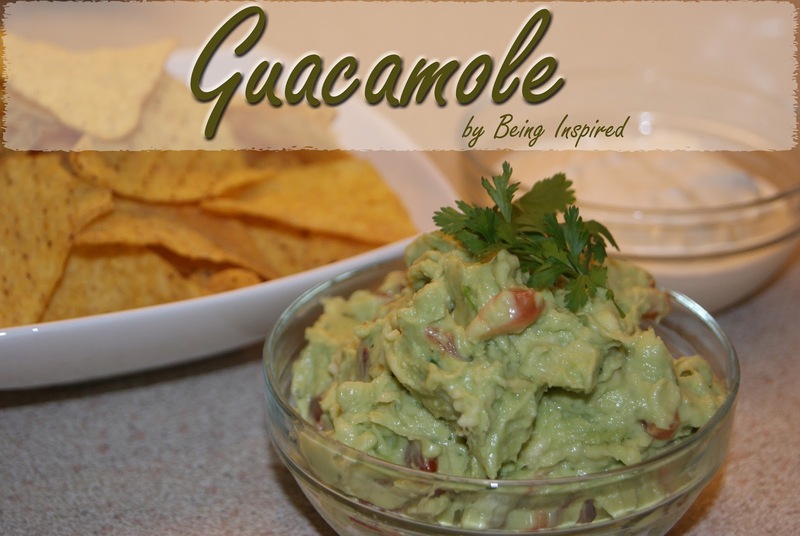 - Gently press the outside of the avocado to test for ripeness. There should be a little give, more than you'd accept in other fruit and veg! - Trick for removing the stone - hold your avocado half and carefully try to slice the stone with your knife. The knife will get wedged in the stone. Twist the knife to free the stone and it'll come right out! Want to make a butterfly cushion of your own? Of course you do! Choose some fabric for the main part of your cushion and a cushion pad. You can do this all in felt but I had the perfect sized piece of soft brushed cotton so I used that instead. Wrap your fabric around your cushion pad to see how much you need. Leave about 1/2" overlap at the edges and 4 - 5" overlap for the flap at the back. There's no buttons or zips so make sure it's overlapped enough and then cut it out. Pick some cute butterfly templates (or download mine here). Cut them out, trace around them on some good quality wool felt and cut out. It's up to you how many you do or what sizes you like but I used 1 of the biggest two, 2 or the next two and 3 of the smallest butterflies. 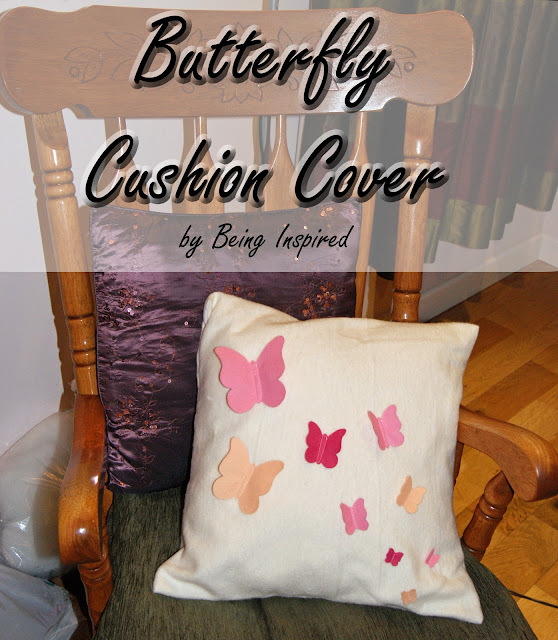 Pin your felt butterflies in place on your cushion. Sew around the centre of each butterfly so that the wings are still free to flutter but the butterflies are secured in place. Next sew a hem on each end of your fabric. Just fold it over, pin in place and sew a straight line along it. Or a slightly wavy one if you're like me! :) I only hemmed the edge that you can see from the outside but then sewed it wrong and had to rip and redo! Oops. Next take your fabric and wrap it around your cushion pad again. Make sure it's inside out (i.e the butterflies are facing the cushion and can't be seen), then pin the overlap closed. Pull the cushion pad out and pin the sides. Then turn your cushion cover the right way out and pop your cushion pad inside! This is what the back of mine looks like. - Use a good quality wool felt , not your craft shop stuff. It looks and feels much nicer and it'll hold its shape better. - Make sure to line up the front of your cushion properly. I really wish I'd taken a second to check mine, those big butterflies should be a little closer to the top. - Just sew a hem on both ends of your fabric. Then you won't make my mistake and sew it wrong and end up with the unfinished edge on show. On the plus side my stitch ripping skills are coming on nicely! 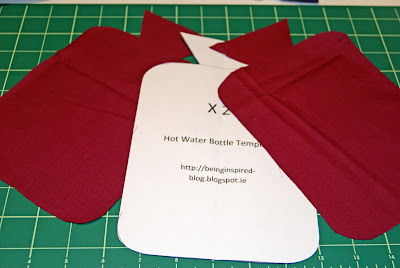 - As there's no zip or buttons or anything this is really quick and easy to make. My favourite kind of project! The trickiest part is negotiating all the fabric around the machine as you sew the butterflies on. - You could make this a bit fancier and add a little detail to the butterflies but I kinda like it plain and simple like this.